yesterday, i tweeted that i was going to do some "selfish-sewing", a.k.a., make something for myself. i honestly didn't start until 2 hours later or so (ahem. me and my sister had some degrassi to catch up on and got distracted by say yes to the dress afterwards), but i knew i wanted to make a dress. i'm usually busy working on stuff for the shop, so it's rare that i actually make something for myself...and i really should, too, because when i have an itch to shop, i end up buying a dress, which is silly because i could just make one for myself! it's a weird habit. so i made one earlier, using leftover blue rayon and vintage black & white striped polyester for the skirt. i might hack the skirt off and make a fuller one. haven't decided yet. i was going to add heart pockets too, but then i couldn't figure out if i liked wearing it forwards or backwards. i'm indecisive like that. and yes, i'll add a bow tomorrow. i mean, i can't make a dress and not put a bow on it. that would be blasphemous. maybe that's why i don't make things for myself? i can never decide how i want my own things to look like! sandy suggested i do some sewing tutorials, and i think that'd be fun! i'm going to try working on a romper tutorial, at her request. i want to attempt to make sewing tutorials that are easy, but fun and still fashionable. are there any things you guys would like to learn how to make/sew? speaking of tutorials, mel invited me to do a guest post for her domesticated fridays! 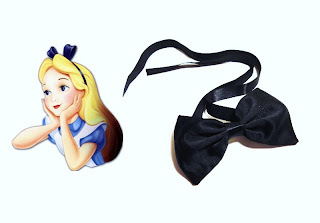 i wrote a tutorial on an alice in wonderland inspired ribbon bow headband. check it out here or on cut out + keep! also: the giveaway ends tonight!! !